When you arrive at the counter to place your order at Uncle Maddio's, you are warmly and politely greeted as if you are a favored family member. You can choose from an appealing selection of food. You create your own pizza or choose from signature pizzas and paninis. 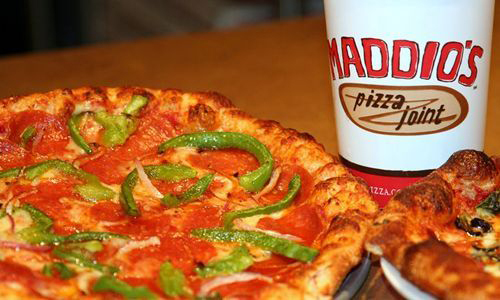 Uncle Maddio's pizzas are made-from-scratch secret recipe dough and pizza sauce using fresh local veggies. Rounding out your great pizza is a build your own salad bar which includes only the freshest selections. The overall ambience of this pizza joint is very welcoming, relaxing, and upbeat, and the food is fabulous!